Seborga is a very small (about 14 square Km) Principality in Liguria, the north west part of Italy (click here to see the map). The capital city is Seborga, the currency is called Luigino and there are about 350 citizens (but over 2000 residents). Seborga became a principality in 1079 and has been so called since the 14th century. Then when Italy was made it was never added to the Italian country, maybe for mistake... or at least this is what they and their Prince Giorgio I say. I don't know the truth about all this, if it is really an independent principality or not, but I can say that many people there wait to be recognized internationally. 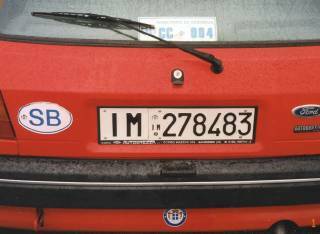 Seborga has got some own license plates, but they cannot be used in Italy or anywhere else, so cars do need also another standard Italian license plate, as you can clearly see in the third picture. You can also notice there the oval of Seborga (SB), but this is as unofficial as its plates are. The series of plates shown in the first two pictures has been discontinued and remaining plates are available for collectors, but this is all I know about. 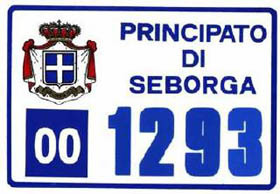 Anyway in 2000 a new series of plates made of metal was started, as you can see in the last picture, and they are issued only to the citizens of Seborga (and not the residents). Up today there are about 400 of these plates on the roads and the plate with number 001 is used by the prince. 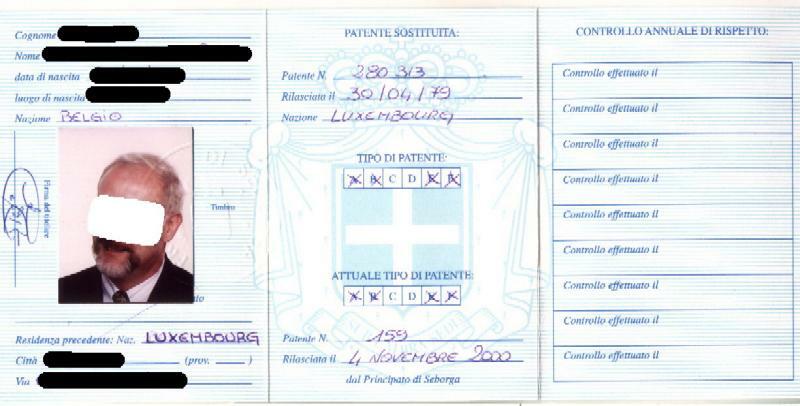 The cost of the sample plate is about 10 Euro plus a shipping fee. 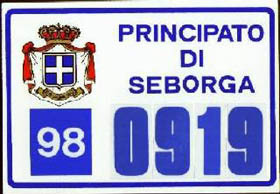 If you want, you can also see the driving license printed by Seborga, though I believe that it has no official value outside the Principality: click here to see the outer side of it and click here for the inner side. I want to thank Jean-Emmanuel Chevry for the first picture, Stephen Cioffi for the second, Olav Arne Brekke for the third and Roberto Tarabella for the last: they are all very nice!